Welcome to GlamHer Lash Studio and The Eye Opening World of Eyelash Extensions! GlamHer Lash Studio now provides first class education and training in-house for Eyelash Extensions. Read on for further information. Deposits of half of trying costs are required. Call today to reserve your place in class! You must be a licensed cosmetologist, aesthetician, or RN to take this training. Would you like to add these fabulous treatments to your resume or salon? Have you scoured the internet to find a reputable training course only to be overwhelmed by the cost? (training, supplies, travel, hotel, etc.). Look no further!! GlamHer Lash has the expertise to pass on this awesome skill with options to fit your budget. $900 - Including : Student Kit, workbook, certificate of completion, consent forms for your clients, and one day of intense training with hands-On experience. Deposits are non-refundable. $1300 - Including : Student Kit, workbook, certificate of completion, consent forms for your clients, massage table, 1 additional hour of coaching/shadowing 1 month after training date and two days of intense training with hands-On experience. Deposits are non-refundable. $800 - 4 hours advanced training Including : certificate of completion, one full day of intense training with hands-On experience, advanced techniques for classic application and removal technique. $500 Perfect for clients who crave extra curl and definition for their natural lashes, last 4-6 weeks. Deposits are non-refundable, but can be applied to another class within 6 months of original sign-up date If you must reschedule, please cancel 48 hours before class start time or forfeit deposit. 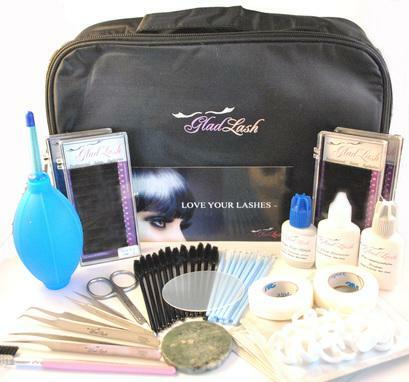 67 Piece - Salon Professional Mink Eyelash Extensions Kit. Good for beginners to advanced eyelash extension technicians. Enough products for approximately 60 applications. The Professional Travel case is lightweight nylon yet durable measuring 11"L x 7"W x 3.5"H. Includes top and bottom compartments for all your eyelash extension tools. For a list of all items included in this premium kit. 3 Trays of the most popular Salon Professional Individual Single Strand Lashes: .15 or .20 x 9 thru 12mm or the mixed length option of CCurl .15 and .20 x 7 - 12mm one tray each.